High Accuracy ◆ The scale can weigh up to 3 kg with an accuracy of 0.1 gram. Attention: Accurate to 0.1g does not mean that the minimum weighing starts at 0.1g. The scale weighs from 0.3-0.6g to 3kg. After 0.3-0.6g, it is accurate to 0.1g. Multi-Function ◆ The kitchen cooking scales with backlighting has several functions: Tare function (press "T" to reset), and the conversion function between G / OZ / CT/ GN (press "M" to convert ) and automatic shutdown to prevent the batteries from being worn too fast (Batteries not included). Small & Compact ◆ Easy to store with the small size of 12.6 * 10.6 * 1.6cm. It takes up minimal space on your desk, makes it a pro pocket scale makes it easy for carrying. Ideal for placing on the kitchen counter and the modern design will give a stylish touch to your dining room. 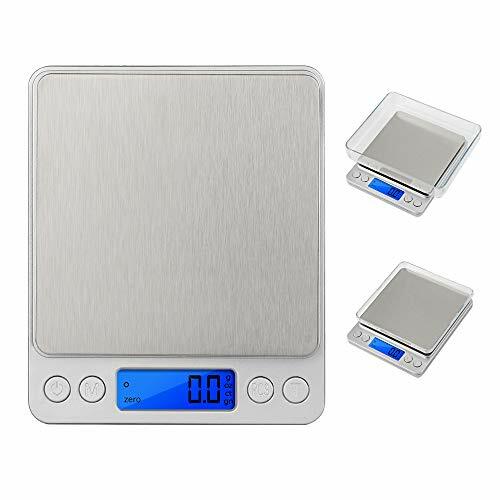 LCD Display ◆ Slim shape and elegant silver design make this food scale stylish. A clear, easy-read LCD display with blue backlight. Life Assistant ◆ An ideal balance for your homes, kitchens, offices, mail rooms to weigh your letters, jewelry, food etc.